David Ingalls was born in Cleveland, Ohio on January 28, 1899. 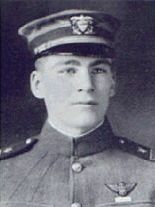 In the fall of 1916, he entered Yale where he joined the first Yale Aviation Unit and trained at Huntington Bay, Long Island and Palm Beach, Fla. He qualified as Naval Aviator number 85, in August, 1917. He was 18 years old. After the war, Ingalls returned to Yale to complete his studies and earned a law degree from Harvard.In 1929, President Hoover appointed him Assistant Secretary of the Navy for Aeronautics. In this capacity, Ingalls administered the Naval Aviation and Development program. He tested every type aircraft in the Navy inventory and was instrumental in a spectacular period of growth in Naval Aviation. At the outbreak of World War II, Ingalls volunteered for active service and became Operations Officer for the Commander, Naval Air Force, Pacific, and then Chief of Staff of the Navy Forces at Guadalcanal. He received the Legion of Merit for his service and retired as Rear Admiral in 1959. David Ingalls' contribution to Naval Aviation and service to his country are without equal.